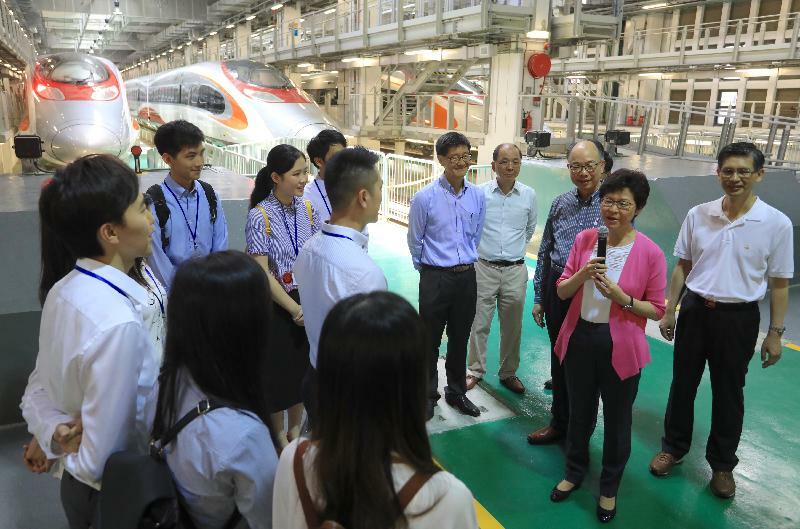 The Chief Executive, Mrs Carrie Lam, visited the Shek Kong Stabling Sidings of the Hong Kong section of the Guangzhou-Shenzhen-Hong Kong Express Rail Link (XRL) this morning (July 9) and viewed the XRL train which is just delivered to Hong Kong. 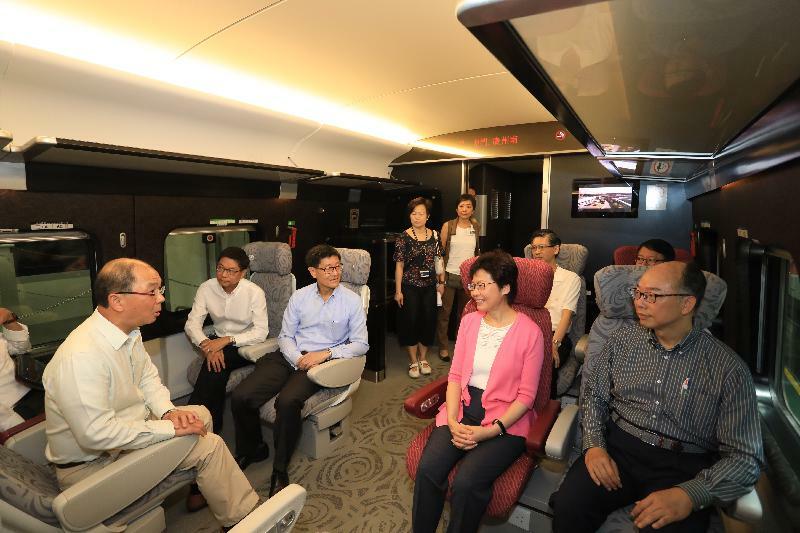 Mrs Lam, accompanied by the Secretary for Transport and Housing, Mr Frank Chan Fan; the Director of Highways, Mr Daniel Chung; and the Chief Executive Officer of the MTR Corporation Limited (MTRCL), Mr Lincoln Leong, listened to the sharing of the technical personnel involved in the delivery of the trains, and were briefed on the design features of XRL trains. A number of young engineers from the Electrical and Mechanical Services Department (EMSD) and the MTRCL were also present in viewing the XRL trains. 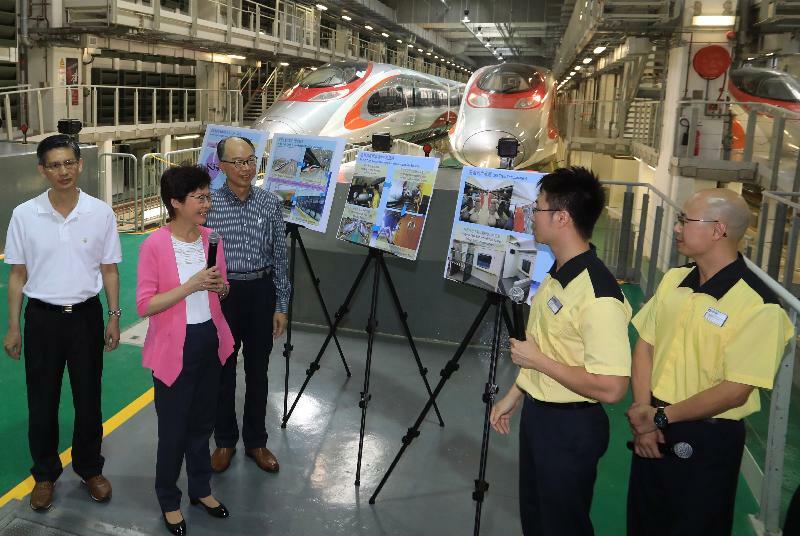 The Hong Kong Special Administrative Region (HKSAR) Government ordered nine XRL trains through the MTRCL, and the third one was just delivered to Hong Kong on July 6 by rail all the way from its manufacturing plant in Qingdao, a first to take this route. It signifies the completion of the interface tunnel between Huanggang in Shenzhen and Mai Po in Hong Kong, meaning that the 26-km Hong Kong section of the XRL is now connected to the national high-speed rail network. The first two trains were delivered to Hong Kong by sea in September 2016 and January 2017 respectively. The remaining six sets of train will be gradually delivered to Hong Kong by rail in the second half of 2017. 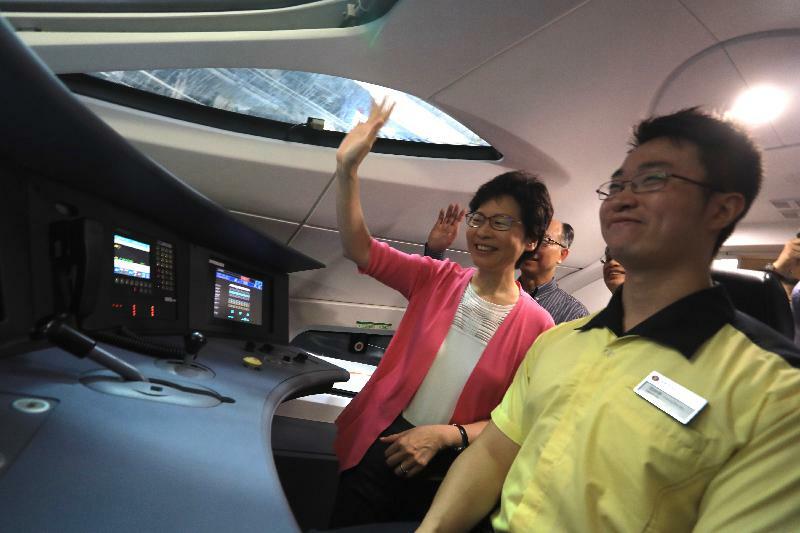 Mrs Lam said, "The Hong Kong section of the XRL is a strategic infrastructure project which forges ahead for the future of Hong Kong. It will significantly enhance the connection between Hong Kong and Mainland cities, thereby providing more room for career development and living for Hong Kong people and creating new opportunities for our next generation." "I am glad to know that the overall construction progress of the Hong Kong section of the XRL is over 90 per cent complete and has entered into the final stage, with the integrated testing and commissioning of the railway system due to commence shortly." "For the XRL to bring the anticipated benefits and for travelers to enjoy the convenience, 'co-location' is the most appropriate arrangement. The HKSAR Government's discussion with the Central Government on co-location arrangement is at the final stages. We will soon announce a comprehensive proposal which complies with the Basic Law and has sound legal backing." "Many members of the public look forward to the operation of the XRL. 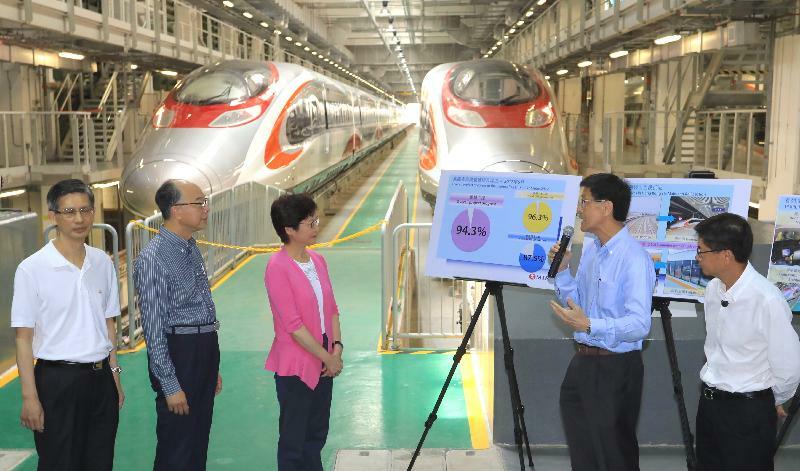 The HKSAR Government and the MTRCL will continue to press ahead the XRL project with a view to meeting the target commissioning date of the third quarter next year, so that Hong Kong people may enjoy speedy and convenient railway service as early as possible." Mrs Lam also talked with the young engineers from EMSD and the MTRCL to understand their daily work. As the Hong Kong section of the XRL will come into service, EMSD’s railway regulatory role and the MTRCL's railway service will become increasingly multi-faceted. 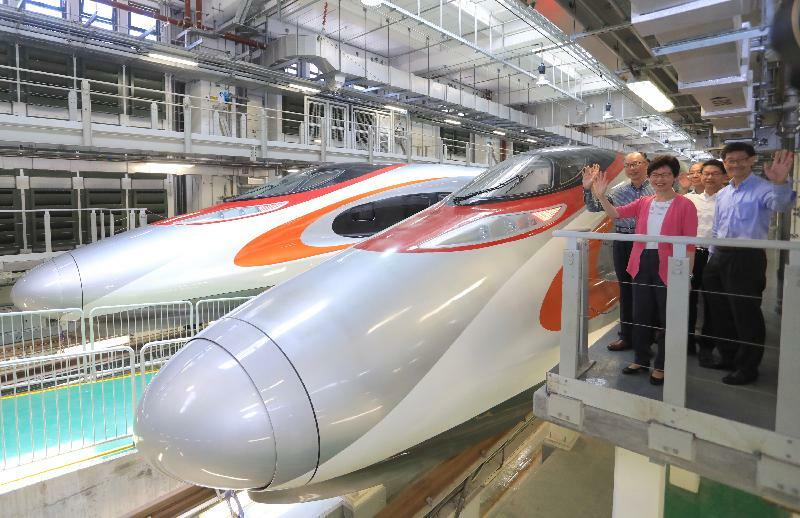 She encouraged the young engineers to grasp the opportunity, learn about the latest developments of the national high-speed rail, and continue to serve the Hong Kong community by pursuing excellence in their work. Upon commissioning, the 26-km Hong Kong section of the XRL will substantially reduce the rail journey time between Hong Kong and various major Mainland cities. For example, the travelling time between Guangzhou and Hong Kong will be shortened from around 2 hours to roughly 48 minutes, whereas those for Beijing and Shanghai will be reduced from 24 and 19 hours to roughly 10 and 8 hours respectively. The project will foster interactions at the community level and economic ties, as well as strengthen Hong Kong’s role as a regional transportation hub.